The moment you enter Sedona, you can see that there is a deep and rich history. First with the recognizable red rocks that started forming thousands and thousands of years ago, then with the Native Americans, and finally with a more recent history. To be a part of this vast historic community and to create your own Sedona history, get in touch with a realtor today who can help you find your home here. Brian & Cindy Real Estate would love to show you around the town and many beautiful and timeless historical sites. 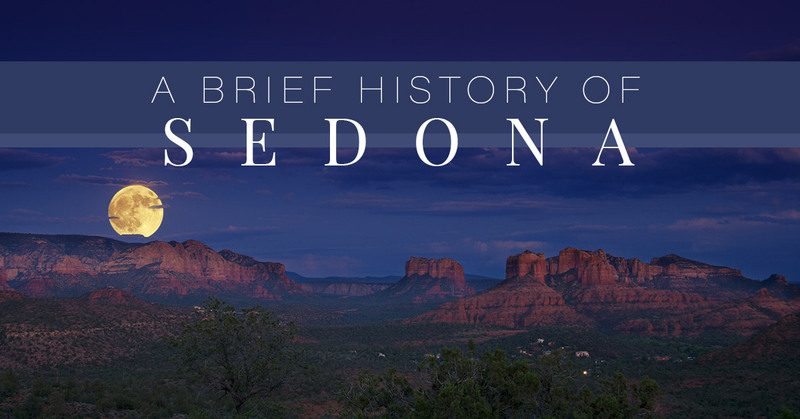 The earliest signs of inhabitants in the now Sedona area were as far back as 8,000 B.C. and can be seen in prehistoric dwellings, petroglyphs, and other evidence. Groups of people moved in an out of the area for thousands of years, “Paleo Indians,” then “Anasazi Indians,” followed by Hohokam between 500 and 700 A.D. The Hohokam used irrigation farming, which can be seen in canals that can still be seen today. Later, the Sinagua tribe lived in the area. This tribe eventually created dwellings that were built into the sides of cliffs, which can be seen Montezuma Castle which is 40 minutes south of Sedona, and the Palatki Ruins, which is 40 minutes northwest of Sedona. At the turn of the 20th century, families began exploring the area. Ellsworth Schnebly convinced his brother and his brother’s wife to come live in the area. His brother T.C. and his wife, Sedona moved from Missouri. When the family wanted to open a post office, Washington D.C. wanted a name that wasn’t too long. T.C. named the post office after his wife, Sedona. The farming in Sedona began as families growing food for themselves. Using water from Oak Creek, they grew small patches of vegetable gardens, they also had chickens, cattle, and pigs. What really helped the economy to grow, however, was apple and peach orchards. The fruit from the area was sold to markets in neighboring towns, like Flagstaff and Phoenix. Because Sedona has such beautiful scenery, the town became known for Hollywood western movies being set there in the early to mid 20th century. Movie stars such as John Wayne, Joan Crawford, Robert DeNiro, and Robert Young were among the first to find fame in the area. Since the very beginning of Sedona, families recognized the wonder of the red rocks and sought to put down roots in the mountains. Beauty can be seen year round and residents will never tire of seeing and exploring the historic sites and trails. Brian & Cindy Real Estate want to be your realtors and want to help you find your new home and a place within the history of Sedona. Whether you are looking to buy or sell a home, having a realtor on your side who knows what Sedona has to offer, will make all the difference As realtors, we want to give you the tools and knowledge necessary to make a decision that is right for you and your family. Give us a call today to get started.